.:Soul:. | The Many Faces of My Virtual Self. 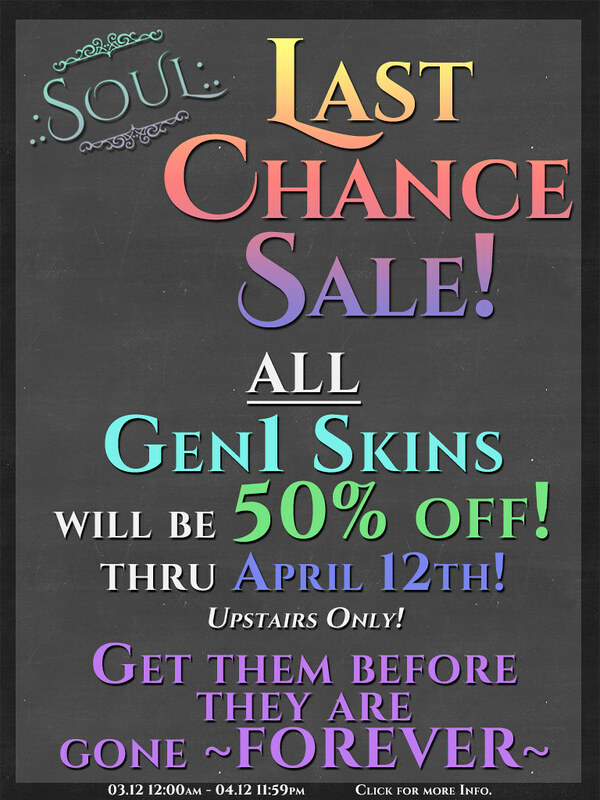 This is your LAST CHANCE to grab the Gen1 Skins before they are GONE FOREVER! They are already removed from the marketplace and after the sale, only redeliveries will be allowed. The 50% off sale will go from March 12th 11:59pm to April 12th 11:59pm. Both the Lucky Chairs and Group Gifts have had new additions added to them! Keep your peepers peeped for the full Ferals line of eyes. Henley is Out Now at Mens Only Monthly with 25% off! Hailey is at the Mainstore for 25% off for VIP Members!